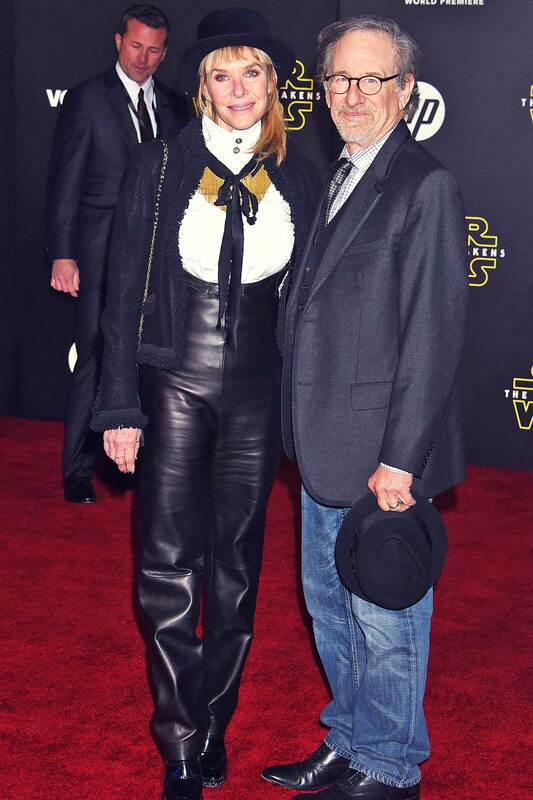 American actress Kate Capshaw attended the World Premiere of Star Wars: The Force Awakens at Hollywood Boulevard in Hollywood on December 14, 2015. The 62-year-old was all smiles as she posed for the pictures with her husband, Steven Spielberg. Kate decided to wear a bizarre black and white outfit that consisted of black leather dungarees, a white blouse and black bolero jacket. She slipped her feet into a pair of black shoes, adding a few inches to her height, and carried a stylish quilted bag on her right shoulder. Kate was wearing her blonde locks down, and sported a black fedora hat over her locks. She kept the jewellery to a minimum, while she sported a pink palette of makeup, finishing out the look with a slick of pink lipstick.